Because fish and other sentient aquatic animals are not recognized as individuals. Because they are not protected in any way. Because a huge majority of animals farmed and captured are aquatic animals killed for human consumption or to feed other farmed animals. Because their fate is unknown to the public and often ignored by animal rights campaigns. The World Day for the End of Fishing asks for the abolition of fishing and fish farming for fish, crustaceans and cephalopods. Thousands of billions of fish, cephalopods and crustaceans are killed every year. A large number of these animals go through agony in the open air, are bled to death and eviscerated while still conscious or are thrown back at sea using pitchforks. Others die bursting open from severe decompression as fishing nets are hoisted back from marine depths. As for the prisoners of fish farms, they live in horrible conditions, in filthy, crowded spaces filled with parasites. 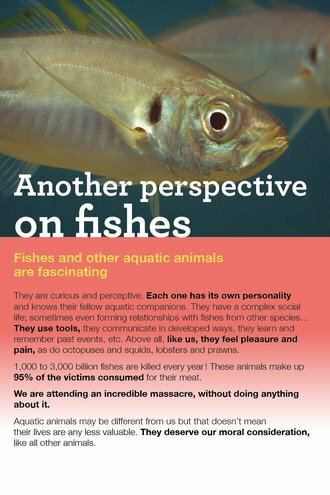 Because fish do not live on land, because they are not mammals like us and because they do not express emotions through facial gestures or audible cries, they are subjected to an acute form of speciesism. Since they do not look like us, we don’t identify with them or their plight, we underestimate their capacity to experience suffering and pleasure, as well as their mental and social capacities. We don’t think about them, nor about how they are captured and farmed when their dead bodies are displayed in fish stores or used as ingredients in industrial goods of various kinds. This concealment makes a day devoted to refusing their exploitation more than necessary. We don’t need to eat fish or other animals to live healthy lives. We can eat healthy diets without contributing to the massacre2. Helping people whose income depend on fishing can be done. Incitatives and economic reforms can be put in place3. All societies accept that we should not inflict unnecessary suffering and death to animals. 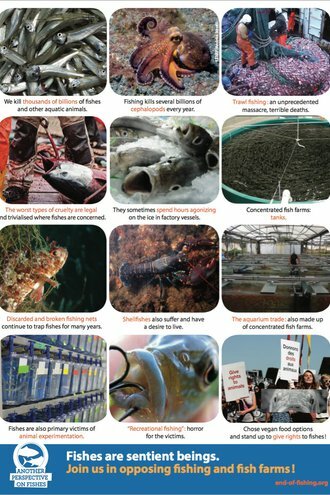 Given the immense harms we cause fish and other aquatic animals, and given the massive number of individuals affected, we should put an end to their exploitation and stop killing them for their flesh. The enslavement and killing of other animals for human consumption cannot be justified. The demand to end fishing and fish farming answers is a question of justice: like all sentient beings, fish and other aquatic animals should have recognized fundamental rights: the right to life, freedom and physical integrity.